Although the calculation used to determine the overall score is complex, the rating table used for Financial Health, Accountability & Transparency and the Overall Rating is the same as illustrated below. To help understand the calculation for determining a charity’s overall score, we provide a visual tool on each charity’s rating page. The following graph is an example of what is shown on the ratings pages. 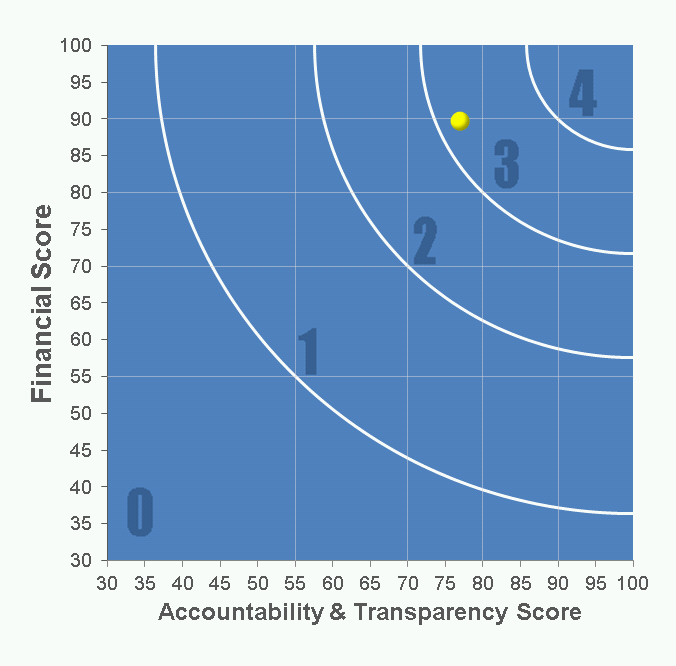 In this example, the charity has a score of 88 in Financial Health (3-stars) and 77 in Accountability and Transparency (2-stars). Following the 88 score on the vertical scale and the 77 on the horizontal scale to where they meet, it is easy to see that the charity earns a 3-star overall rating. You can also plug the charity’s two individual component scores – (1) Financial Health and (2) Accountability and Transparency – into the boxes below. This tool will perform the complex distance formula calculation for you so that you can easily obtain the charity’s overall score.